A while ago my children expressed interest in learning Spanish, and what a blessing it's been to review several Spanish programs as a member of the Schoolhouse Review Crew! 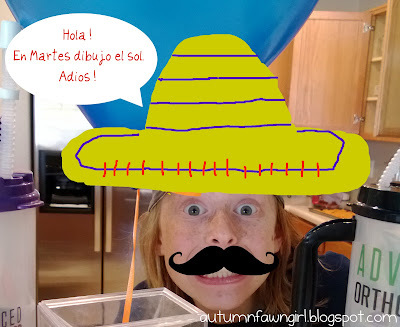 Recently the Crew had the opportunity to review a couple of Spanish for You!® products. Spanish for You! is a curriculum developed by Debbie Annett and illustrated by her daughter Amanda Annett for grades 3-8 for home or class use. It teaches children how the language works, and helps them to be able to truly communicate in Spanish. 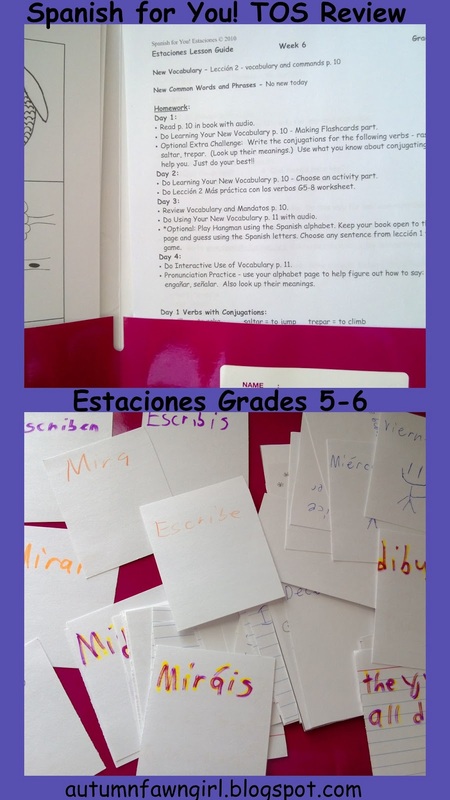 My fifth grader is using Estaciones which is currently one of two themed packages available. The Estaciones theme is seasons. You can click the link to view the Table of Contents, instructions on how to use the program, a lesson guide note to parents, and a sample lesson. All of this information is included in the book, too. We received a Spanish for You! Estaciones physical book; an audio download (MP3) of the entire book (you can choose to listen to a native speaker or the author); downloadable lesson guides in PDF format for grades 3-4, 5-6, and 7-8; self-checking worksheets in PDF format for all of the grades listed; and flashcard/activity pictures in PDF format as well. Downloading and finding files is easier than ever with the few changes Ms. Annett has recently made. She says, "All worksheet files are now in folders according to grades - grades 3-4, 5-6, and 7-8. All audio files (native and non-native) are now in folders according to lessons - leccion 1, leccion 2, etc. I divided the non-native audio file into 2 parts so that downloading is faster and easier." This entire package can be purchased for $64.95. Individual grade levels can be purchased separately for $39.95, and extra books can be purchased for an additional $12.95. The package is a great deal considering the fact that you can use it with multiple children. All of these concepts are learned through reading, writing, listening, and speaking activities/worksheets and games. Spanish for You! is not based on completing levels, rather the more packages your children complete the more components they know. This gives them the ability to put together everything they've learned which in turn helps them to be able to communicate more effectively. So, the packages can be completed in any order. As I said before, there are currently two available, but a third will be ready in June. There are five lessons in Estaciones which cover the calendar and weather, fall and school, winter, spring, and summer. Each lesson is broken down into several weeks. For grades 5-6 there are a total of 24 weeks which can definitely be spread out over an entire school year. This book is designed to be used 4 days per week but can easily be adapted to fit any schedule. My son chooses to work on Spanish Monday-Thursday, so the suggested 4 day schedule works well for him. So far, we've gotten away with using index cards only. Because my fifth grade son is the only one using this curriculum right now, we don't need supplies for games that require more than one person. 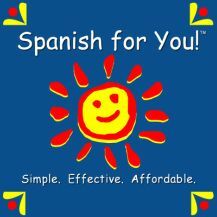 How We Are Using Spanish for You! Do Learning Your New Vocabulary p. 10 - Making Flashcards part. Optional Extra Challenge: Write the conjugations for the following verbs - rastrillar, saltar, trepar. (Look up their meanings.) Use what you know about conjugating mirar to help you. Just do your best! At his age, he is doing everything on his own. He does ask me to help him review his handmade flashcards every once in a while, though. Here's what my crazy boy had to say about Spanish for You! : "It's good and it's easy. I can do it on my own and there's not a lot of writing. I can really say stuff and am learning a lot of words." He did tell me that he doesn't like having to grade his own work. I actually think it's great that he's supposed to check his own work because then he really has to look at what he misses, and he can correct it right away. I am quite pleased with this Spanish curriculum and plan to continue using it with my son. Next year, I will pass it on to my daughter who will be in third grade. Right now she is finishing up a different Spanish program that just teaches the very basics, so she should be good and ready for Spanish for You!. Click to read more Spanish For You! reviews from the Schoolhouse Review Crew.